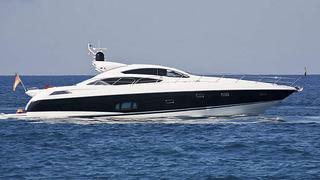 Busy times at Sunseeker Germany as Guenter Buettner send news that he has the 22.6m motor yacht Destiny III for sale. Built by Sunseeker in 2009, this Predator 74 introduces increased interior volume. At a size appropriate for crewed or owner operation, she offers the lower deck saloon option and a spacious garage for storage of the Williams tender. The submersible bathing platform and spacious cockpit area with a teak table and a generous seating area make for relaxing, comfortable cruising. Twin 1800hp engines give Destiny III a cruising speed of 25 knots and she's aking €1.59 million.